Welcome to Carolina Speech Services. We are pleased to offer online accent reduction classes and English speaking practice online. It is important to us that logistics not get in the way of you reaching your full potential with accent reduction classes. With busy professional schedules and traffic to contend with, why not take advantage of today’s ability to stay connected from a distance. Our same great accent modification programs are available to you no matter where you live or work, with virtual English pronunciation and accent reduction courses. Improve your English pronunciation and dialect with expert help from our licensed Speech-Language Pathologists. Improve your spoken communication with accent reduction for increased confidence and clarity with clients, colleagues, supervisors, and peers. Our online accent modification programs are customized just for you. We start with an online accent screening tool you can complete today. Our staff will evaluate your results and review them during your initial phone consultation. We’ll also discuss your personal and professional objectives to further explore how a custom accent modification training course can help you meet your individual goals. When you first get started, one of our licensed Speech-Language Pathologists (SLP) will conduct an in-depth evaluation to assess how you produce sounds that are commonly used when speaking English. Areas observed such as phrasing, intonation, and rate will be used to further customize your accent modification training program to fit your individual needs. At that point, your SLP will recommend a customized online accent reduction program. Each online class can be conducted LIVE through our easy to use private video conferencing software. During your class, you’ll practice speaking English with pronunciation help from our expert. We will record a reevaluation of your speech at the end of the program to measure your success. We offer an “iron-clad” guarantee. If you are not impressed with the results of your online accent reduction classes, we’ll refund your tuition. Call or contact us today to get started 704-845-1605 or begin with our FREE no obligation online accent screening. 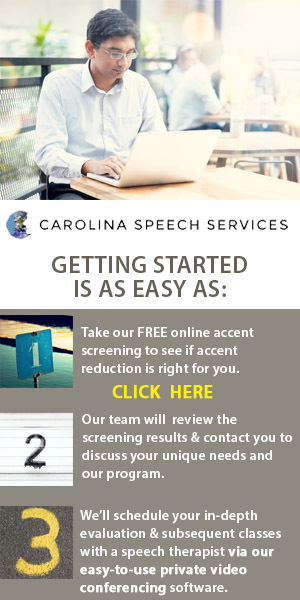 Learn what to expect with Carolina Speech Services on our Accent and Dialect page.